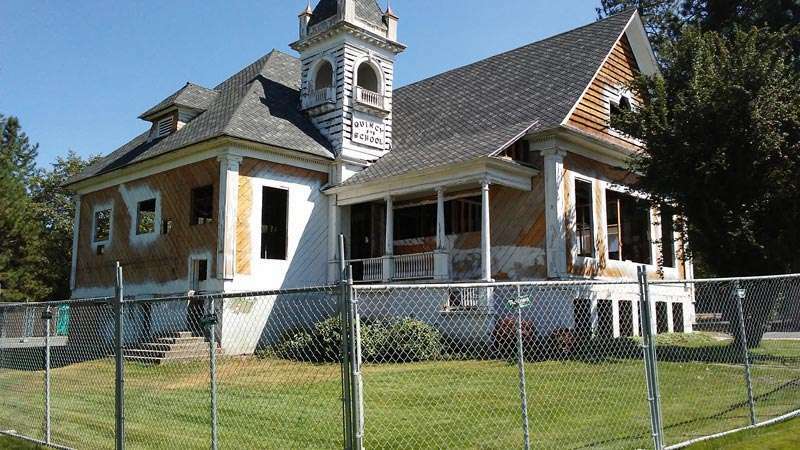 The Plumas Unified School District’s Governing Board of Trustees held a special meeting Aug. 16 to consider bids received for 63 modern replacement windows needed at the historic Quincy Schoolhouse that is under major renovation at 50 Church Street downtown. Voting 3-0 to accept the lowest bid and disregard two other bids that did not meet correct submission requirements, Board President Leslie Edlund and trustees Dave Keller and Dwight Pierson approved a $43,581.81 phase-one contract with Pella Doors and Windows of Northern California to supply the new energy-efficient windows. The bid doesn’t include installation. Trustees Joleen Cline and Traci Holt were unable to attend the meeting. “I can tell you, that is a very good bid for these windows,” Pierson said. At an earlier school board meeting held Aug. 8 in Quincy, Pierson had reported that he and fellow Friends of 50 Committee representative John Sheehan had researched options to acquire new windows that would resemble, as closely as possible, the old windows that had been removed from the historic schoolhouse when water damage, mold and other structural compromises had been discovered as part of the rehabilitation project. The school board had originally planned to review and approve bids for the windows at the Aug. 8 meeting but found it necessary to extend the bidding process. The bidding was successfully concluded in the following days and the new contract covers purchasing the windows, but not installing them at this point. Installation will require going out for separate bids, according to the district. In other business, the trustees unanimously agreed to reissue a bidding request for vital re-roofing work needed on 20 portable buildings at local school sites before winter arrives. The building roofs need to be taken down to the plywood and replaced, according to the school district, and it’s hoped the work can take place before Sept. 30, depending on the re-bidding process. At Chester Elementary, seven portables need to be re-roofed. The library and nine portables at C. Roy Carmichael Elementary require re-roofing work. And Quincy Elementary’s Alder Street site has four portables that must be re-roofed while the school undergoes other essential repairs. The project will be put back out to bid at the recommendation of Plumas County Office of Education staff because the lowest bid received earlier in August did not include unit pricing as required by the language in the bid form and their bid was disqualified. The trustees agreed to reject the first round of bids received and to start the process over. It is anticipated bids will be accepted until late August or early September. As the school board meeting wrapped up, Trustee Pierson expressed appreciation for all of the school site improvement work that has been completed so far and is currently underway. For details and full information, contact PUSD at 283-6500. All I know is they had better get that place ready for winter. They took off all the outsides and now it is exposed for winter elements. A lot of us are concerned.